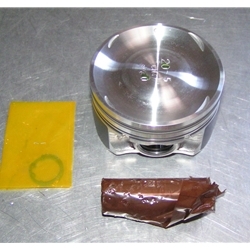 Piston, 2.0 VVL, VET 9:1 or so (fits SR20DE), Piston from the SR20VET motor. These are the OEM pistons from the SR20VET in the X-Trail. Compression should be around 9:1 in a VE motor. Skirts are factory coated as pictured. Some modification will be necessary in some applications. Call for info. **Priced Each.